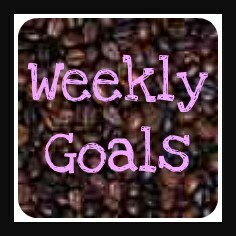 Well what do you know, it's Monday and I am actually getting to the Weekly Goals!! I took the week off last week as I have been dealing with some unpleasant side effects from new medication and I just haven't felt well. Laundry has piled up, housework is way backed up and there are a few dishes to do. This weeks goals are not going to be huge or monumental because I will not be able to accomplish those! 1. Get back to doing Family Game Night once a week! 4. Try some new things with my hair, this ponytail thing is just not cutting it! 8. Get out Bill's Spring clothes and put Winter clothes away! 9. Put onions in and make seed tapes for other veggies & flowers Made seed tape for beets, carrots, and radishes and got them all in the garden just before it rained again!! You will note that taxes are listed twice, obviously I am running out of time! I got the dress I won in the mail last week and I LOVE it! I wore it for Easter, it was so nice not to have to worry about what I was going to wear and if I looked or felt ok in it! I am hoping to be able to get pictures taken in it this week and be able to blog about it. Today I am hanging out with one of my favorite 3 year olds while his momma works, he is so much fun. He loves to sing and dance and play like a wild man and it reminds me of when my guys were little! Speaking of my guys, My ELEVEN year old son is now wearing size NINE men's shoes, who is giving this kid miracle grow? Hard to believe that I am going to have a Jr Higher this fall, it is exciting and scary all at the same time. Hope you all had a blessed Easter! We got up early and went to the 8am service and it was a powerful service! If you are interested in checking it out you can watch it here: Easter Service. I have really been convicted this year how much "stuff" we do on Easter that has nothing to do with what our Savior did for us. Why do I feel like giving my kids toys & candy is an appropriate way to celebrate the death and resurrection of Jesus? I ended up taking some things back that I had gotten for them and they still had more than enough. We need less stuff in our lives and more Jesus to fill those spots that we think that "stuff" fulfills. Less stuff, more Jesus. That needs to be my plan, to get all the extra stuff out and spend more time studying the Bible and reading it. It sounds simple but I know that it will be challenging for me, it will take a lot of effort for me to let go of stuff and be still so that I can study and listen. I hadn't planned on getting so serious but it was on my heart so out it came! One thing we do with the boys is hide one empty egg among the candy filled ones. It made my heart happy yesterday when my 6 year old was able to tell me why it was empty without help from his brother! It's empty because the tomb is empty! He is Risen!